The New York Times (via TVNewser) discovered that CBS "60 Minutes" fixture Mike Wallace will retire: "After serving as a correspondent on 60 Minutes since its inception in September 1968, Mr. Wallace said today that he had decided to retire this spring, at the end of the current television season. He said that the move had come at his initiative, and that 'CBS is not pushing me.'" Conservatives might not want to cheer too loud. TV Newser suggests in the next posting, a tipster told him executive producer Jeff Fager wants more room for refugees from the cancelled "60 Minutes II"...So now there will be more room for former 60 II correspondent Scott Pelley and the rest of the team. "Don't be surprised to see Aaron Brown join, along with the newly recruited Katie Couric...imagine that!," an e-mailer says, adding "now who will replace [Andy] Rooney?" The departure makes some sense, as Wallace just recently sold a new version of his memoirs. 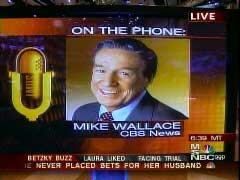 And now CBS is off the hook on those gun-control stories Wallace was supposed to skip. Dan Rather spoke at a Cherry Hill, New Jersey high school last night (Wednesday), South Jersey's Courier-Post reports this morning, and reporter Jim Walsh noted (without irony) that the disgraced and replaced CBS Evening News anchor proposed “Rather’s Rules” for improving journalism. Mary Mapes Bashes Conservative Bloggers As "Sexist," "Racist"
I'm a little surprised that disgraced CBS producer Mary Mapes hasn't drawn a little more blogger interest for her (okay, tired and bitter) latest appearance on the Pacifica Radio show "Democracy Now." It was a two-part interview. Last Thursday, she was reliving her downfall after her Bush-bashing October Surprise as those obsessive bloggers took over: "in fact, by the time our story was off the air on the west coast, I mean, the moment it went off the air, it was -- it went nuts. In Stale Admirers-Only L.A. Event, Dan Rather Warns Bloggers "Manipulate Public Opinion"
Dan Rather: "Too Many People Want To Advance Their Own Partisan Agendas" As "News"
Via Orbusmax, some odd words from Dan Rather in the Portland Oregonian, produced from softball questions by the paper's Jonathan Nicholas. You can’t swing a dead cat lately without smacking into an article concerning Congressman John Murtha’s (D-Pennsylvania) view of the necessity to withdraw American troops from Iraq. In fact, as reported by the MRC’s Brent Baker, Murtha is going to be on CBS’s “60 Minutes” discussing exactly that on Sunday with none other than Mike Wallace. However, for some reason, that same demised feline has little chance of ever coming in contact with a report of the Congressman’s proclivities to take funds from Washington lobbyists. Today, the Pittsburgh Post-Gazette broke ranks from the mainstream media in this regard. 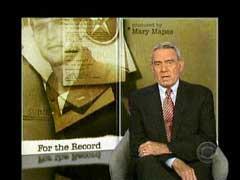 The media’s idolizing of Democratic Congressman John Murtha, who in November advocated withdrawing from Iraq, will continue on Sunday’s 60 Minutes, which will feature a segment on him and his supposedly prescient forecast that most troops will soon leave Iraq, by Mike Wallace, a journalist who has already made clear that he shares Murtha’s view of the war. In late November on FNC, Wallace contended that "Iraq is becoming a kind of Vietnam" and asserted that "we should never have gone into Iraq. We were sold a bill of goods." 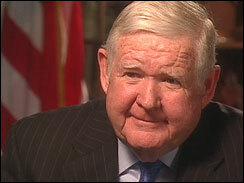 Back in 2004 at a Smithsonian forum, Wallace argued that “this is not, in my estimation, a good war” and declared that “it sure is not a noble enterprise.'" Few shows have shown more of an anti-Bush, anti-conservative slant than CBS's "60 Minutes." (See this report on their complete Bush v. Kerry one-sidedness in 2004.) But that doesn't mean CBS people will admit it. CBS's "Public Eye" site has a question and answer feature called "10 Plus 1," which is ten questions from Public Eye staffers and one from the public. 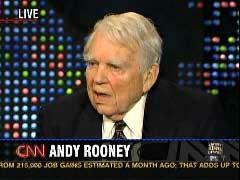 Tom DeLay’s ouster from the House leadership is the “one good thing that's come out” of the Abramoff scandal, CBS’s Andy Rooney declared Friday night during a live appearance on CNN’s Larry King Live. Asked by King about “the tapping of phones in the interest of national security,” Rooney called it “a disgrace, an absolute disgrace.